Which T9->T10 Line Overall Is The More Competitive Package? Need your experienced insight again. Discount crew transfer has tickled my interest for a new tank. I have the AMX 30 but I was thinking of picking up the T8 B-C again to unlock one of the A-L since A-L are so much fun on fast tanks, but I know very little about either of those T9-T10 lines. So, which overall is the better choice in the current meta do you feel and why? One is a light tank class and the other a medium but by all accounts they're both pretty much played as light tanks. Also, why one and not the other in your opinion? Or, has the new car option pretty much retired both? I'll add 2 choice options to the Poll just in case you guys feel one is stronger than the other at different tiers and also a car option. Edited by TungstenHitman, 07 April 2019 - 10:42 PM. I dont have inside info im affraid but i get rekt by B-C's far too often so there must be a reason that they are better than the other options. I enjoy the 13 105 and 13 90 a lot more than my 25t, can recommend the light line. Really fast vehicles with decent gun handling. The batchat is a bit meh nowadays, compared to the 105 it pretty much trades away gun handling, camo on the move, slightly longer intra-clip reload, some mobility and the small profile for 2 extra shell in the mag. Grinded batchat when the tier 9 was Lorraine 40t so can't say anything about the AP. T9 AMX is ok, but unspectacular: it just lacks an area to shine: the gun is ok, the turret armour is ok, the mobility is ok,.... but in the end you just don't have a great auto/re-loader like Standard B/Skoda T50 nor solid armour like 430. T9 BC is imho trash. It has the typical french 100mm gun (shared with AMX65t, 50/100, Sumoa, Lorr 40,....) with 6 shot autoloader making it basically an 50/100 on tier 9 - a bit faster and smaller. Sadly the tank gets module damages like no tomorrow and the long reload cupled with rather bad gun handling make it hard to play. While it has a much higher clippping potential than other T9 meds the others have gunhandling and flexibility - not to mention that litterally ANY non-arty on T9 is more survivable. T10 BC while not OP still is as unique as allways: a scout yet with enough clip to take out whole tanks - and without the crippled pen T-X lights get. T10 AMX is just useless - you get the tier 9, but instead of an upgrade you acctually get a downgrade as the turret becomes a lot wreaker. 13 90 all day baby. It's about the amx light tanks, not the mediums. Also, 13-90 and bc 25t. Although I also regularly play the 13-105. It can have its nice moments, but it remains a tier x lt.
and this. I voted 13 90 and BC25T both are good tanks, for different reasons and with different playstyles. Note both lines require exceptionally good crew to shine. 13 90 can even outperform T9 MTs, with that said, BC 25t is also a very good tank. AMX 13 105 can have its moments, but I would take 25t over 13 105 any day. It has a much better gun, great camo rating, nice mobility. The only problem with BC25t is the derpy gun handling. Other than that, it's an amazing tank. Crew is not bad. I'm off today too so I can get cracking on improving a bit more with the X3 crew thingy but I also have to make a nice beef casserole. Tough life! oh and my cat needs some food. BC-12t is pretty "meh". The tank itself is fine..its just that tier 8 is so effed its not even funny. Its like playing a gimped tier 8 MT...which says something about how fun it is to play...that being said the autoloader makes it somewhat useful. The 13 90 is much, much better in every aspect and a lot more enjoyable to play. I guess the Bc, if you can make it work it is a monster, especially mid to late game. 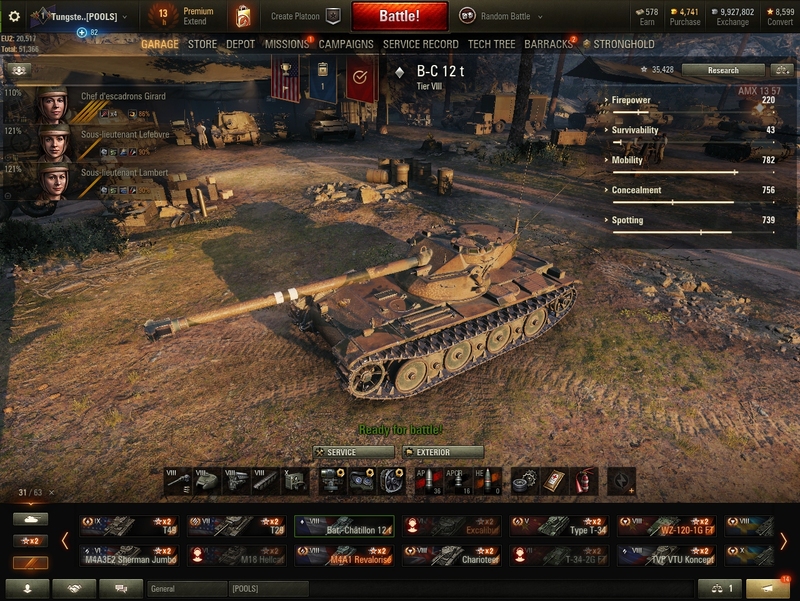 Tier 10 BC is great, not easy to play and it really struggles with the armour meta, but it's still a ton of fun. At tier 9 the 13 90 really outclasses the BC though. It's more mobile, the reload makes the gun more useful, the BC catches fire/has a damaged engine every time looks your way. Well I'm glad I asked since I really have no idea about those T9 and T10 Frenchies. So it seems general consensus is the light tank is the better performer at T9 and the BC is the significantly the better performer at T10? Well, just go to show that paper stats don't always tell the truth since I would have looked at the T9 BC vs AMX and seen the BC has a faster aiming and more accurate gun with punchier alpha and higher pen along with that extra hp for being a med so would have thought the T9 BC was the better choice, so that was a surprise to say the least. I've started playing serious scouting with the AMX 12t and am happy with the progress I'm doing. I'd go for the mobility and camouflage, AMX all the way, literally. I might as well get the non autoloaders after getting the T9 AMX. Ya I love light tanks actually and have been playing pretty much nothing but the T8 BC for the grind and the T9 T49 which I have simply fallen in love with and can't stop playing. Picked up another rare Tamada's medal just a few minutes ago which I was surprised with at T9 but there it was at the end of the battle, into the shiny shiny drawer it goes. If you guys look at the enemy team in that screenshot you will see a British heavy called the T95/FV4201(RIP). I never saw this tank before and it's not on the tech tree. Looks amazing and the stats read nice too with good turret, excellent aim time, accuracy, dpm, alpha and pen etc and looks pretty damn quick for a heavy, more Russian like, but, how do we get that tank does anyone know? Edited by TungstenHitman, 10 April 2019 - 09:15 PM. That T95 is OP and every time I see it playing my Type 4. I instantly load gold HE and wait for the trucker. want the most competitive tank which branches off bc-12t? Then dont bother with amx 13s or bc-25s, just get the amx 30 1er prototype.